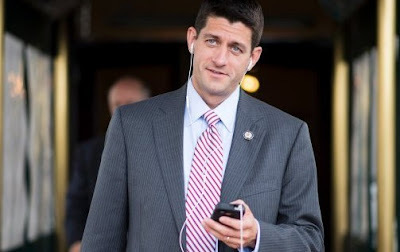 Paul Ryan, seen here listening to "Smug Hits of the '80's"
WHY DOES PAUL RYAN’S PLAYLIST END AT “L”?! I mean, if he’s a fan of AC/DC and Led Zeppelin, he’s surely got some Mötley Crüe or Whitesnake in there, right? What about Twisted Sister? Are we to believe that Paul Ryan went through his entire life willing to “take it”? As my friend pointed out, "What kind of monster doesn’t have at least some ABBA mixed in?" Even if we are to believe that Paul Ryan listens exclusively to metal and hasn’t been tempted into potentially calling Carly Rae Jepsen, party rocking, or celebrating within the bounds of America alongside Miley Cyrus, that would make Paul Ryan a guy who listens exclusively to metal and is completely out of touch with mainstream America! 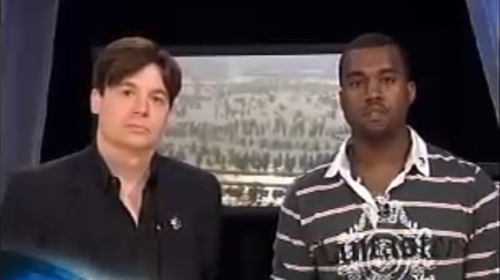 "Paul Ryan hates black music..."
I don’t want that kind of guy anywhere near the Presidency. AC/DC and Zeppelin Guy can DJ my house party, plan a rafting trip, or sell me weed, but I’m not putting him in the White House. Doing that sounds like the plot to an unreleased Pauly Shore movie from the ‘90’s. You know what doesn’t scream “Starting a war for no legitimate reason?” Bon Iver. The Head and the Heart. Taylor Swift. Mix it up, is all I’m sayin’. 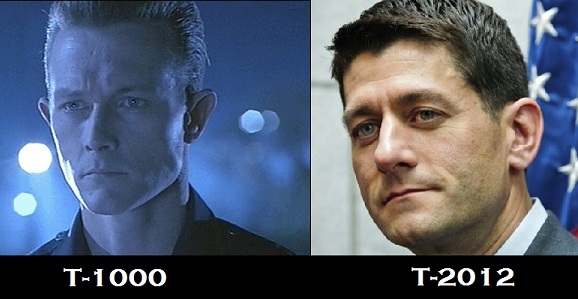 We get that you want to sound like a youthful badass, but you already look like the brother of the T-1000. Stop trying so hard; you’re freaking us all out. Besides, if I’m going to vote based on someone’s appreciation of Black Sabbath, then Chuck Klosterman is a much more appealing candidate. But enough about Paul Ryan, right? He’s only the Vice-Presidential nominee. What was it he said about Mitt, again? Oh yeah, that he’s heard Mitt’s music on hotel elevators. I understand this probably means he listens to a lot of James Taylor and thoroughly enjoys “The Girl from Ipanema,” but what if Mitt Romney’s iPod is stocked solely with muzak? Isn’t that something we should know? I’m pretty sure only sociopaths and the deaf listen to muzak for enjoyment, and it seems entirely possible that Mitt Romney is so out of touch that he sees muzak as some kind of higher art form. So while Paul Ryan’s comment was made in jest, he has inadvertently given us a window into the musical hellscape that is Romney/Ryan 2012. We may never see all of those tax documents, but for the sake of the American people, please, show us the iPods. When you evaluate the term the term enjoy, not only in terms of an enchanting relationship utilizing an additional, however for a sensation that may be engendered should you have miltchmonkey an improved relationship with ourselves way too -- and even like a experience of bigger oneness family members or simply humankind ( blank ) that gets to be substantially more crystal clear that each one anyone is looking to get in life can be love.